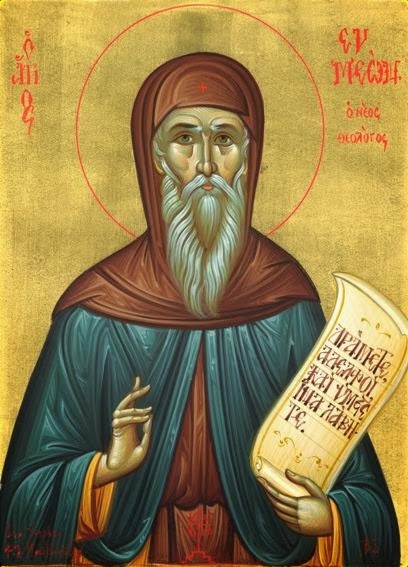 The venerable Symeon the New Theologian was born in 949 in Galatia of Paphlagonia (Asia Minor). He studied in Constantinople and subsequently entered the imperial court as a dignitary. However, because he sought higher things, he was not satisfied with worldly positions. He had the blessing to connect with Elder Symeon the Pious, under whose guidance he lived in spiritual asceticism. And while he was still a layman he obtained his first experience of the uncreated Light. At the age of 27 he entered as a novice in the Monastery of Studion and later in the Monastery of Saint Mamas, where he became a monk and was ordained a priest. After spending three years in the Monastery he was elected abbot, yet because he wanted to enforce the monastic rules of Basil the Great he was met with vociferous opposition from the monks and resigned. While he enjoyed great honor in the overall environment of Constantinople, he was opposed by the former Metropolitan of Nicomedia and the then Chancellor, Stephen. The cause of Stephen's jealousy was his intolerance to the reputation of Symeon as a theologian. And because he could not criticize him for any other reason, he used the fact that Symeon, on his own initiative, celebrated in his Monastery the memory of his late spiritual father Symeon the Pious. The result was the exile of the Venerable One to the deserted area of Marmara. There he found the ruined Church of Saint Marina, which he renovated with his own personal effort, and then built a Monastery, which gathered many monks. His reputation spread and many important people in Constantinople visited him seeking spiritual guidance. Ultimately he was vindicated, but he remained in the place of his exile until his venerable repose. His memory was established to be celebrated festively on October 12th, because the day of his repose (March 12th) coincides with the period of Great Lent. Of his writings, there exist 92 discourses and 282 practical and theological chapters, as well as theological hymns. The Church has awarded him the honorary title of "New Theologian". "There is no greater sin than to approach God without fear, respect and reverence." "He who prays or chants casually and disdainfully to Him who even the Seraphim fear, obviously is ignorant of Him. For this reason even if God wanted to have mercy on him, he could not." "It is better therefore to not chant at all to God, than to chant only with the mouth." "Just as the nous sees and the nous hears, in the same way the nous should chant through the mouth." "Therefore the nous should chant to God through the mouth. Because, however, it is impossible and impractical for the nous to chant unless it has previously accepted illumination and the energy of the Holy Spirit, we must take care of this before everything else." "We must first correct the nous, for it to be focused when it prays, when it reads and when it is taught. Otherwise, everything else is futile and progress will never come to the soul." "For the extent to which the nous is corrected, everyone is also given the measure of the knowledge and awareness of themselves and God." The nous is the eye of the soul. When the nous is illumined, then man can see the glory of God, can truly know Him, and can acquire self-knowledge. In this state, his prayer is pure and heard by God. The nous is illumined when one struggles to apply the commandments of God in their life, and to live the ascetic, prayerful, and sacramental life. "Children, youth and elders are invited to the temple of the Lord and during the services are bored, but in the theaters and the dances and at the games they rejoice, running to them eagerly. So what great strength is needed by human nature to change and eliminate what is against nature which he considers according to nature, and to acquire the ethos which is according to nature but appears to be against nature? Therefore, unless they are altered by the grace of Jesus, they cannot move to be according to nature." Many times we have heard the view, especially from so-called nature worshippers, that the natural life is life in nature, and therefore the natural man is one who loves nature. Others consider the life of sin to be the natural life, and even refer to sinful acts as natural things, and consequently those who sin without a conscience and without repentance are perfectly normal people. However, in accordance with the teaching of the Orthodox Church, as expressed by Saint Symeon the New Theologian, as well as other Fathers, the natural man is the one who by the Grace of God and their personal struggle transforms their passions and is regenerated spiritually. That is, they reach the state which the First-Created Adam and Eve were in while in Paradise, or even higher since they have been united with Christ. Before their fall into sin, Adam and Eve were natural people, since they were fulfilling the purpose for their creation. They had an illuminated nous, could see God and speak with Him. They had true love between them and loved all of creation. Therefore, a person within the Church has the ability to be united with God, and when he succeeds in this by the Grace of God and their own personal struggle, then "he will observe the Grace of the Holy Spirit residing within him and energizing the virtues." According to Saint Symeon, "the person who lacks the Grace of the Holy Spirit is dead to God, and unable to have citizenship in the heavens", while those who are energized by the Holy Spirit are spiritual people, full of vitality, with fullness and meaning of life. Source: Ekklesiastiki Paremvasi, "Όσιος Συμεών ο Νέος Θεολόγος", September 2011. Translated by John Sanidopoulos.